Use the same materials and techniques that professionals use to build their models. Our silicone mold rubber and urethane casting resins faithfully reproduce even the most microscopic details, so you can be assured of getting exact duplicates of your most highly detailed patterns. And they're so easy to use, you can make perfect castings in as little as 15 minutes! #82083 ONE-to-ONE/RAPID is an economical general purpose mold rubber that is easy to mix: Simply stir equal volumes of A and B together and pour. 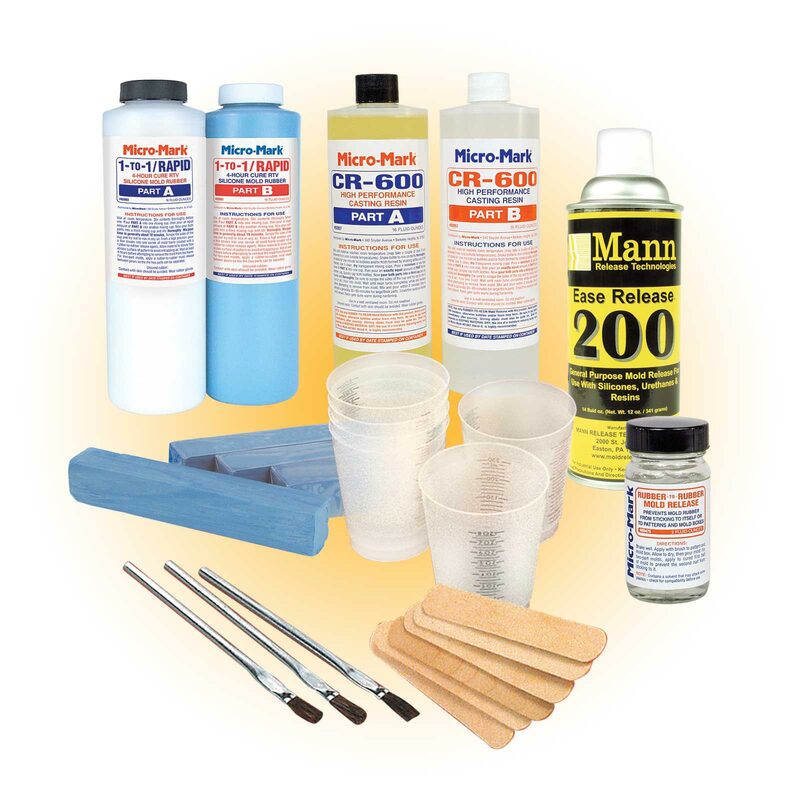 Use over and over to make many resin castings, even those with slight undercuts. 30 minute pot life, 4 hour cure. De-airs without vacuum. 3.2 lb. kit contains approx. 32 fl. oz. total material. #82057 CR-600 Casting Resin (provides more time for mixing and pouring) 7 minute pot life; demold in 30 minutes. 2.4 lb. kit contains approx. 32 fl. oz. total material. #80475 Rubber-To-Rubber Mold Release Required when making 2 part RTV molds. Keeps mold halves from sticking together. 2 fl. oz. #80476 Modeling Clay A special synthetic clay that will not contaminate silicone rubber. Use for containing flow of RTV during mold making and for making simple molds. (Place a little talcum powder on the part and press it into the clay. Then carefully remove the part and pour resin into the cavity.) 1 lb. #80352 Mixing Set Includes six 8 oz. calibrated plastic mixing cups, six stir sticks, three brushes. #82664 Rubber-To-Resin Mold Release Makes it easy to remove resin castings from molds. 14 oz. spray. NOTE: #82698 Starter Set ships by ground to 48 contiguous U.S. only. For customers located outside the 48 contiguous United States, please see item #84264.